Tomato season is here in Maryland! I am so in love with sweet summer tomatoes. I haven’t had much time to cook during the week lately, so right now we are focusing on making huge batches of things that reheat well. Curry is one of those things, and a great way to use up the huge bags of tomatoes we are getting in the CSA. 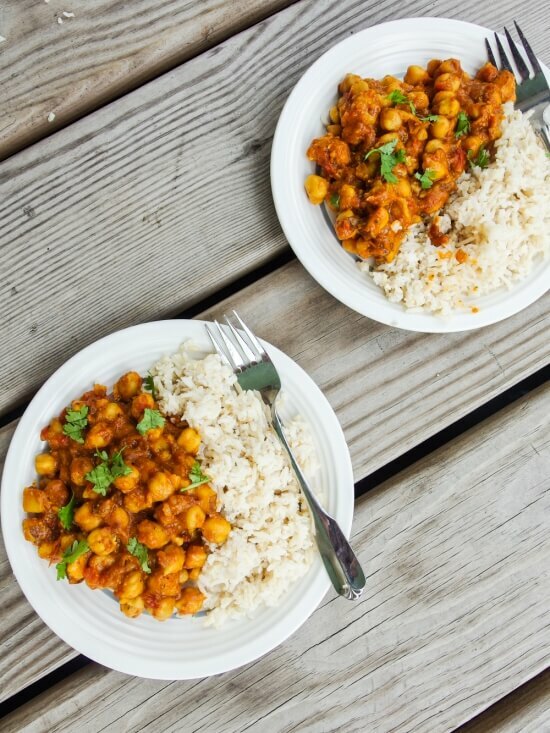 This chickpea vindaloo recipe is something that I started making in college, long before going the vegan route. 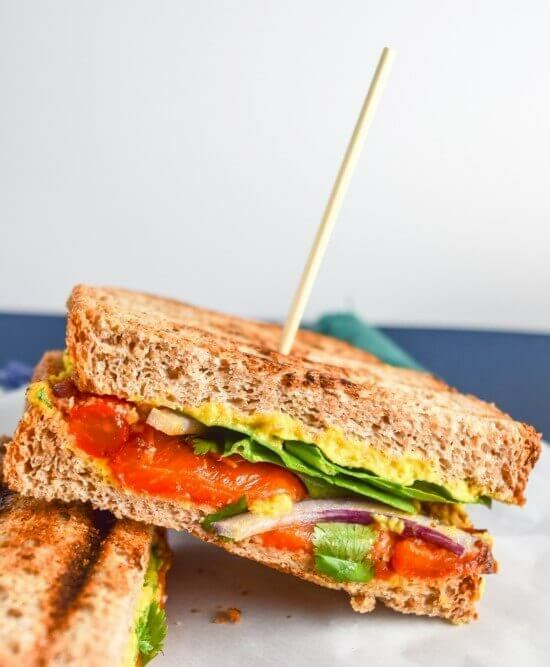 Over the past few months I have had the pleasure of cooking lots of recipes by Vegan Richa, and I learned from Richa that freshly toasted & ground spices are so worth taking the extra time for. I used to make this vindaloo with ground everything and the flavor just pops so much more with a fresh curry paste. Buying whole spices can be a bit of an up-front cost, but they last a lot longer on the shelf than their ground counterparts. If you don’t have all of these whole spices in stock then feel free to mix and match whole vs. ground, as it will still taste really good. I will make my standard disclosure here that I am making no claims of authenticity with this recipe. I have done my best to research what is classically included in this spice blend. I think this tastes pretty close to what they have at my favorite Indian restaurant, though. From what I understand, vindaloo was actually inspired by a Portuguese dish in the beginning, and the most important part is that it’s very spicy and tangy. In particular, it seems to be up for debate whether potatoes should be used. That was an easy choice for me this time because we had potatoes that needed using. 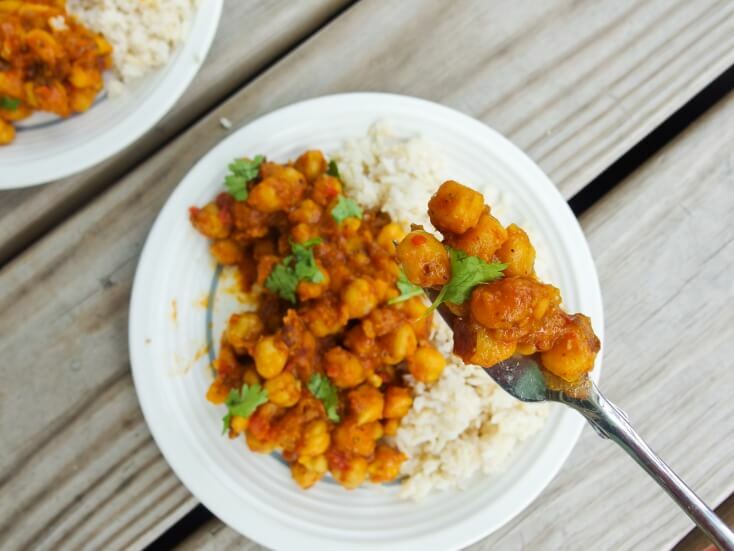 An easy, flavorful gluten-free & vegan chickpea vindaloo - chickpeas in spicy and tangy tomato curry. Make your own vegan vindaloo at home using flavorful fresh curry paste. Note that you need to soak your chickpeas in advance. Soak the chickpeas overnight, or for 1 hour using this quick soak method. Cover with plenty of water as they will nearly double in size. In a large saucepan, warm the coconut oil. Add the onion and a pinch of salt, and stir. Cook for 3-5 minutes, until the onion is softened. Add the potato and stir. Drain and rinse the chickpeas and add them to the pot along with the potatoes and 5 cups of water. Bring to a boil and then reduce to medium heat. Partially cover the pot. Continue to stir occasionally, and cook until the chickpeas are tender, about 40 minutes. Meanwhile, in a skillet over medium heat, melt the coconut oil. When it begins to shimmer, add the cardamom pods, coriander seeds, peppercorns, mustard seeds, cumin seeds, fenugreek seeds, cloves, and bay leaves. Stir the spices continuously until they become fragrant and start to turn golden, 1-2 minutes. Remove from the heat and pan immediately. Add the spice mixture to a blender along with the rest of the curry paste ingredients. Puree until a smooth paste is formed. Once the chickpeas are cooked through, stir the curry paste and diced tomato into the pot. Continue cooking at medium heat, partially covered, and stirring occasionally. Add 1/2 cup more water if it starts to dry out. Cook until the tomatoes have broken down, 20-30 more minutes. Add more salt to taste, and cayenne pepper if you want it spicier. Serve topped with fresh cilantro, over rice (pictured is brown basmati rice) or with other accompaniments of choice. 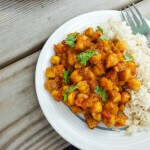 This chickpea vindaloo is a veganized adaptation combined from this chicken vindaloo recipe and this other vindaloo recipe. Do you use green cardamom or black cardamom. I know they have totally different flavors and don’t want to mess up. So, just finished eating it and wow, really impressed. I’ve made quite a few curries and many are simply tomatoes mixed with chillies and coconut milk but this almost tastes like an authentic takeaway meal. You can really taste all the spices and it’s hot and slightly sour that together works really well. :/ ….. was I supposed to grind whole seeds before putting them in the pan?? Or are there supposed to be whole seeds in the paste? Have blended over and over… food processed over and over … seeds still whole:/ I have very good appliances… but it smells and tastes aaaamazing!!! I will try a ground version…. Hey Tara, Sorry that this caused you trouble. I used a Magic Bullet (a very small blender) for making this recipe so I may have overlooked that in larger appliances it would be difficult to grind the curry paste finely. For next time, add a little bit of a water at a time as needed to help blend. There may have just not been enough volume for your appliance to blend it. You can also toast and grind (with a spice grinder, or mortar and pestle) the whole spices before cooking them for just 30 seconds or so in the coconut oil. Hope this helps. Thanks for posting great recipes! 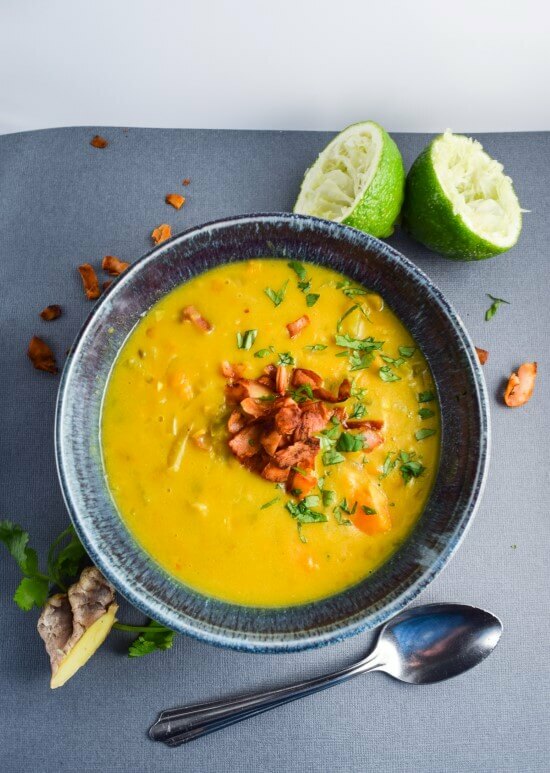 My sister and I are trying to slowly become vegans and your recipes are making it easier to transition. I love to cook so I’m excited to try a couple of your recipes. I was wondering if you have any videos of you making one of your dishes? I am a new vegan and am just discovering Indian food. I went to my new favorite Indian restaurant this weekend and ordered something very similar to this and it was wonderful. I thought to myself – I must learn to make this! Already had this recipe pinned from before — can’t wait to try it! Thank you! I love making my own curry paste, they taste better than the packaged ones! 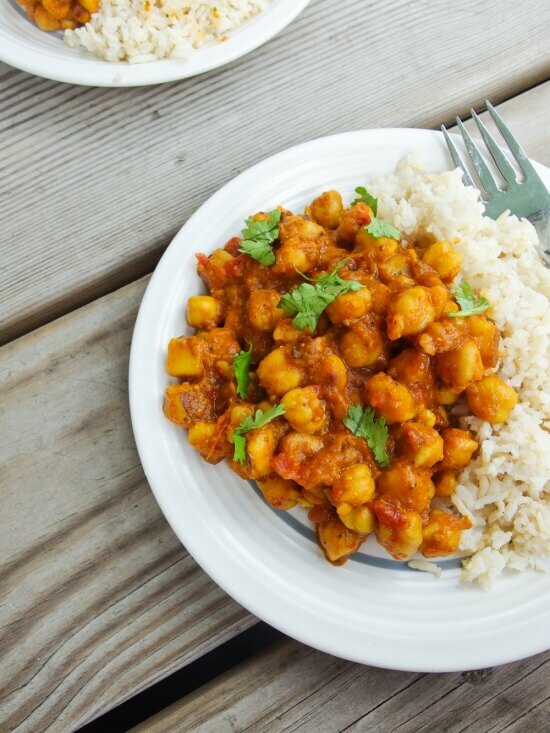 Stunning chickpea curry and I love fresh cilantro on top of curries! Congrats, Shannon, on winning the Best Main Dish category in last week’s potluck! I luv luv luv vindaloo curry! Thank you 🙂 people love their curries! This is my kind of meal! My whole life has been taken over by tomatoes these last couple of weeks (I have a produce over-buying problem!) and I’m constantly looking for fresh ways to use them up. Chickpeas, tomatoes, and warming spices? I’m in! I am having the same tomato problem! Well not really a problem, just an overload of deliciousness 🙂 I absolutely love them in curry so this one was a no brainer. You’re awesome for making your own curry paste. My idol! I need to get on that, this looks amazing! Freshly ground spices are truly much more flavorful than pre-ground! Thank you so much!! That’s a really nice compliment. I hate the lighting in my new house so I am super happy and relieved to hear (read?) you say that. I really need to subscribe to Saveur 🙂 and I only saw this comment, so I guess you are in the clear, lol. Lovely! I love Vegan Richa too 🙂 Such wonderful recipes.